A FEW DECADES AGO A MASTER Plumber told me of a great pipe wrench. This wrench had saved his hide on several occasions, mostly because he had it with him. He had it with him because it was compact, light, and very strong. The brand? Ridgid. Their 10″ aluminum pipe wrench. Easy to pack, doesn’t take up too much room, hard to forget. When I had the money and the right job, I closely followed his advice. Instead of the 10″, I acquired the 12″. Packs perfectly in the tool satchel with a closed length under 14″. Very light. Virtually unbreakable. And if the wrench does splinter apart (I’ve never heard of this happening) Ridgid will be happy to replace it for you. Free. 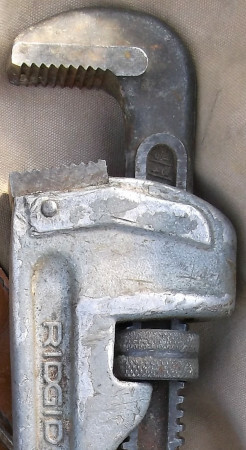 The Ridgid Aluminum Pipe Wrench. A perfect wedding gift for the do-it-yourselfer. This entry was posted in Product Review and tagged A perfect wedding gift, american pipe wrench, jserg photographer, made in usa pipe wrench, RIDGID MODEL 812. I wish I had a nickel for every time I picked up a Rigid Aluminum …. or forged steel for that matter. If I could get that money…..I would have more money a lot more. From 1964 to 2010 I made a nice living turning all of them. Rigid makes a huge compound wrench that will turn 6″ threaded pipe too. That one will make you want your dinner for sure. The second of the two plumbers who signed off on my RMP exam swore by the Ridgid 10″ in his tool bag. I never did get one that small, but can see his point. The 14″ aluminum is always in the truck and jumps in the bag when needed. My 24″ aluminum tags along if I think it’ll make a difference but usually stays home. I’ve got a steel 12″ … wish I could find it! In ’98 or so someone stole my 18″ steel … damn thieves. The 18″ is the go-to…..no decent man would even borrow another mans 18….let alone purloin it.